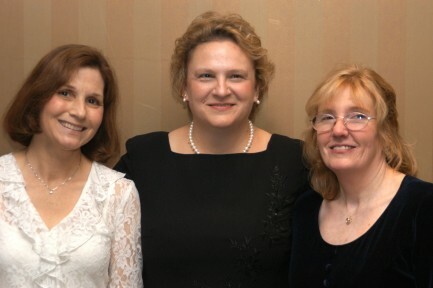 Volunteer of the year for 1999 Debbie Vincent (left) with 2001 volunteer of the year Robin Stutsman (right)and 2002 volunteer Karen Burger (center). Mira Mesa Community Fourth of July Committee president Debbie Vincent has been selected by the Mira Mesa Town Council as 1999 Mira Mesa Volunteer of the Year. MMTC members voted at the April 1999 meeting to honor Debbie Vincent in recognition of her contributions to the community for many years. In addition to her leadership in organizing Mira Mesa’s annual Fourth of July celebration, she has served as a PTA officer at several levels, and as a volunteer with a variety of groups including Boy Scouts, Girl Scouts, Pop Warner Cheerleaders, Mira Mesa High School Cheerleaders, and the Mira Mesa Town Council. This year (1999) is Debbie’s fourth year in a row as the president of the Mira Mesa Community Fourth of July Committee, in charge of planning and fundraising for the all-day event, including the parade, Fun Day and fireworks show (prior to that she was parade co-chair for two years). A past president of the Challenger Middle School PTSA, Debbie continued as PTSA second vice-president (in charge of membership) at Challenger even after she no longer has a student at the school. This school year she is finishing her second year of a 2-year term as the financial secretary of the San Diego Unified Council of PTAs. In addition, she has been elected to a 2-year term, starting in the fall, as the Organizational Vice-President of the San Diego Unified Council of PTAs. Debbie is also the 1999 Mira Mesa Town Council treasurer. Debbie and her husband, Mike, have lived in Mira Mesa since 1983 and are the parents of three children who have grown up in Mira Mesa. The food at the volunteer of the year dinner catered by the Teen Center’s Twister Cafe was excellent. Dignitaries present included School Board Member Sue Braun and State Assemblywomen Susan Davis and Charlene Zettel. Karen Burger, Debbie’s close friend and fellow volunteer of many years, was among the speakers, as were Jeff Stevens and Robin Stutsman. There was the official City Council proclamation from the Mayor’s office. Debbie said afterwards that she planned to get some new frames and needed to find space on a wall to put up all the proclamations she received! The Mira Mesa Town Council wood-framed certificate looked really nice. The dinner was co-chaired by Robin Stutsman and Stephanie Schuck, and Marv Miles was master of ceremonies.